There has been a lot of news about Afghanistan over the past week or more. Two more U.S. personnel died in Afghanistan, the Afghan October election is looming, U.S. policy towards Pakistan has stiffened, the Taliban seem resurgent, Erik Prince seems to have ‘a better idea’ on how to win the conflict, Mattis and others believe peace is possible, security in Afghanistan is getting worse, there is a new RSM commander, and more commentators are calling for an end to the war. Found below are selected news reports, analysis, and commentary published over the past several days. U.S. Army Casualty. The Department of Defense announced that SSG Diobanjo Sanagustin died on Tuesday, September 4, 2018 from a non-combat related injury at Bagram Air Field, Afghanistan. He was assigned to the 4th Infantry Division at Fort Carson, Colorado. Insider Attacks. Another ‘green-on-blue‘ incident has claimed the life of an American Soldier. A Command Sergeant Major with the 1st Security Force Assistance Brigade (SFAB) was killed by an Afghan policeman in Logar province. It is hard to prevent these incidents from occurring. Read more in “Deadly Insider Attacks on US Troops Won’t End, Experts Say”, Military.com, September 5, 2018. Erik Prince and Privatization of War. A former Navy SEAL and founder of Blackwater has been advancing the concept of privatizing the military advisory effort and air support provided to the Afghan national security forces. This has some folks on edge. (NBC News, Aug 17, 2018). Bad Year for Afghanistan. Brent Swails of CNN writes of the dismal security situation in Afghanistan in “Afghanistan: A bad year in America’s longest war”, CNN World, September 7, 2018. Bombing Drug Labs – Failing Tactic. Qayoom Suroush, a researcher with the Afghanistan Research and Evaluation Unit (AREU) and former Senior Advisor for Afghanistan’s National Security Council, says the bombing of drug labs is ineffective and won’t advance a counterterrorism strategy. He does offer four concrete recommendations. Read “U.S. Bombing of Drug Labs in Afghanistan is Counterproductive to Fighting the Taliban”, Just Security, September 6, 2018. Death of Jalaluddin Haqqani. A former U.S. ally in the fight against the Soviet occupation of Afghanistan – and then later head of the Haqqani network which has killed scores of U.S. troops – has died. Read “Taliban Confirms Death of Haqqani Network Founder for the First Time”, NPR, September 4, 2018. ISKP in Sar-e Pul Province? Maybe Not. The Russians have a great concern that Islamic jihadist will find their way to Central Asia – and into some adjacent areas of Russia over the long-term. So they are keen to see ISIS contained south of Central Asia. Lately the Russians have proclaimed ISIS is in Sar-e Pul province. However, the folks at Afghanistan Analysts Network (AAN) looked into this Russian claim. Not so much. Read “New Confusion about ISKP: A case study from Sar-e Pul”, AAN, September 7, 2018. AAF’s A-29 and Sierra Nevada. A U.S. aviation firm just scored another huge contract for the purchase and sustainment of the A-29 Super Tucano attack aircraft and related equipment for the Afghan Air Force. Read “Sierra Nevada receives $1.8B for Afghan A-29s”, UPI, September 5, 2018. Afghanistan’s Tank Battalion. The T-55s and T-62s of the only Afghan tank battalion is slowly succumbing to age. Many of the tanks have been cannibalized or sold off for scrap metal. The 3rd Kandak, 2nd Brigade, 111th Capital Division is used basically as an infantry kandak. Its tanks are mostly just fixed gun positions on the perimeter of large and small bases in and around Kabul as well as scattered around the country. Afghanistan used to have hundreds for these Russian tanks but now there are a lot less of the tanks. The ANA has been receiving lightly armored vehicles for its Mobile Strike Force kandaks. Read more in “Afghanistan’s tank battalion is melting away”, by Chad Garland, Stars and Stripes, August 17, 2018. On September 2, 2018 General John Nicholson departed Kabul after relinquishing command to General Austin Miller. Nicholson held a difficult job for 2 1/2 years. Upon taking the RS command he immediately set out to improve the capability of the Afghan National Defense and Security Forces (ANDSF) – especially the Afghan Air Force (AAF) and the Afghan Special Security Forces (ASSF). He attempted to improve the leadership of the security ministries. One of his biggest efforts – part of the South Asia strategy – was to force the Taliban into peace talks. He was partially successful – the AAF and ASSF has grown in size and improved in capability; but the ANDSF as a whole has not. Some leadership changes were implemented but inept and corrupt Afghan senior leaders are still in abundance. There has been lots of talk about the prospect of reconciliation – but no real substance to the media barrage that ‘peace is just around the corner’. Certainly there were other initiatives Nicholson pushed through – some with success and some . . . not so much. History will judge how well the general did under difficult circumstances . . . but from this vantage point . . . he did as well as could be expected. 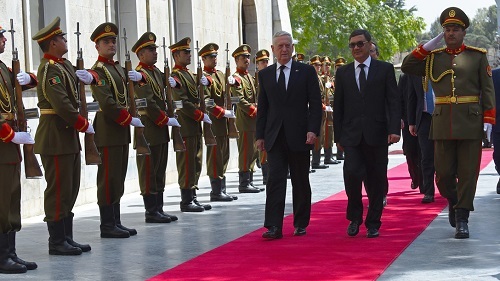 SECDEF Visits Kabul. U.S. Defense Secretary Jim Mattis met with Afghan President Ashraf Ghani and General Austin Miller on Friday, September 7th to discuss the security situation in Afghanistan and the progress on talks with the Taliban. General Joe Dunford went along on the visit. Mattis seemed optimistic on the prospects of peace talks. “Pentagon Chief Makes Surprise Visit to Kabul to Discuss Peace Efforts”, Radio Free Europe / Radio Liberty, September 7, 2018. Negotiations – Nothing to See Here. Move Along. If one follows the news in Afghanistan you could not be faulted for thinking that the Taliban are on the offensive and the Afghan National Defense and Security Forces are on the defensive. Given that assessment of the security situation one could think that the Taliban are not going to be receptive to reconciliation. The South Asian strategy of forcing the Taliban to the negotiating table through battlefield losses doesn’t seem to be panning out. Ionnis Koskinas – an observer of the Afghan conflict – provides his thoughts in “Negotiations With The Taliban Won’t Give Afghanistan What It Needs”, War on the Rocks, August 16, 2018. Reconciliation – The Way Out? “Right now, we have more indications that reconciliation is no longer just a shimmer out there, no longer just a mirage.” (SECDEF Mattis in Kabul). “Mattis, in Afghanistan, tries fostering reconciliation as security worsens”, Reuters, September 7, 2018. Women and Peace. Gayle Tzemach Lemmon writes on how Afghan women are taking a more active role in the peace process. See “The Future for Peace in Afghanistan is Much Brighter”, Council on Foreign Relations, September 7, 2018. China and Afghan Security and Xinjiang. The Uyghurs of Xinjiang province – along with other Muslim ethnic minorities in China – have been subjected to harsh measures. China is deeply concerned with religious extremism, separatism, and terrorism emanating from this remote Chinese region. Xinjiang borders on the volatile countries of Pakistan and Afghanistan and there are fears of jihadism ‘spillover’ from these two countries. The region was brought into the People’s Republic of China in 1949 and China wants to keep it that way. Read more in “Xinjiang and the Stability Paradox”, The Diplomat, by Stefanie Kam, August 16, 2018. Russia and China . . . and Afghanistan. Both countries have good reason to become more involved in the affairs of Afghanistan. Russia is worried about the growth of the Islamic State of Khorasan Province (ISKP) and continues to look for opportunities to diminish the influence of the United States in Afghanistan and the greater Central and South Asia region. China looks to Afghanistan as a source of mineral deposits, trade routes through the Wakhan Corridor, and a way to deepen its influence in South Asia. It also has concerns of Uighur militants using Afghan territory to launch attacks into Xinjiang province. Read more in “Why Russia and China Are Expanding Their Roles in Afghanistan”, Stratfor Worldview, September 5, 2018. China and Central Asia. China’s top military official has been making his way across Central Asia intent on advancing China’s security interests and activities in the region. Read “Why is China’s Top Military Official Visiting Central Asia?”, The Diplomat, September 7, 2018. Afghan Troops to Train in China. China is worried about al Qaeda and Islamic State activities on its western border. The big regional power is going to assist the Afghans in establishing a ‘mountain brigade’ that will likely operate in the rugged Wakhan Corridor that links the two countries. Read “Afghan troop to train in China, ambassador says”, Reuters, September 6, 2018. Pakistan – a Powerful Patron. “The Taliban doesn’t speak for itself, so peace talks are useless without their powerful patron at the table.” Read “Pakistan is Responsible for the Corpses in Afghanistan”, by Sabera Azizi, The American Conservative, September 6, 2018. Pakistani Defiance. For nearly 15 years Washington heaped money and praise on Pakistan in an effort to get it to abandon the support to the Afghan Taliban. That didn’t work. Now a more hard-line approach has been adopted – and it will probably yield the same results. Pakistan has no interest in giving up hopes for a Pakistan-friendly regime and enjoying the ‘strategic depth’ of Afghanistan as a counter to India. 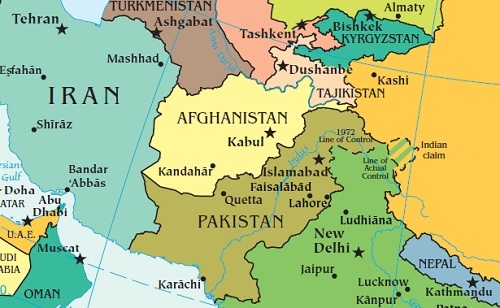 Read “Pakistan Likely to Continue Defying US Pressure on Taliban Support”, by Abubakar Siddique, Gandhara Blog – Radio Free Europe / Radio Liberty, September 4, 2018. Afghanistan – a Democratic Facade. Arif Rafiq, a non-resident fellow at the Middle East Institute, writes about corrupt elections, the divide between the ethnic groups, and the possibility of civil war. He concludes that an extra-constitutional approach may be necessary to keep the country together. Read “Can Afghanistan Be Saved?”, The National Interest, September 6, 2018. Warlords as Political Elite. Many of Afghanistan’s former mujahideen commanders who fought the Soviets in the 1980s are leading members of Afghanistan’s political elite. They bring their fame as mujahideen heroes as well as their reputations for gross human rights violations. Read “Afghan mujahideen: from holy warriors to political chiefs”, France 24,, September 5, 2018. Call for Transparent Elections. A leader of one of Afghanistan’s political parties is calling for the establishment of an interim government to oversee the process of free and fair elections. (Tolo News, Sep 4, 2018). Investigation – Fake ID Cards. The October 20th elections are around the corner but there are concerns about the legitimacy of the elections. Elections in Afghanistan since 2001 have been marred with corruption – and the next two elections scheduled within the year will likely continue that tradition. President Ghani has ordered an investigation into the alleged distribution of fake National Identity Cards. (Business Insider, Sep 5, 2018). Peace and Economic Development. William Byrd believes a new approach is needed during the biennial conference to be held in November, 2018 in Geneva by the United Nations, Afghan government and other countries and agencies. He believes that security and political dynamics should be integrated into Afghanistan’s development agenda at the conference. Read more in “Afghanistan’s Economic Development Hinges on the Peace Process”, USIP, September 4, 2018. Afghan Refugees and Reintegration. Refugees are returning to Afghanistan in large numbers. The influx of millions of refugees from Iran, Pakistan, and other nations have had a negative impact on Afghan society. Many of the problems with refugees is the lack of land ownership. Returning refugees are seeking the return on lands they owned prior to leaving Afghanistan. Read “Problems with the Reintegration of Afghan Refugees”, E-International Relations, August 10, 2018. Mining and Corruption. “The Afghan government’s revision of the Minerals Law has significant gaps in protections needed to reduce the major threat of corruption and abuses in the sector, . . .” (Global Witness, Sep 5, 2018). USAID and Agriculture Projects. The United States Agency for International Development and the Afghan Ministry of Agriculture, Irrigation and Livestock (MAIL) are working together on a $110 million agreement to promote Afghanistan agriculture. (Tolo News, Sep 5, 2018). Humanitarian Crisis. A drought in western Afghanistan and the summer offensive by insurgents has increased the need for humanitarian assistance for Afghanistan. (UNHCR, September 2018). AREU Report on Healthcare in Afghanistan. The Afghanistan Research and Evaluation Unit (AREU) has published a 34-page report on healthcare and health facilities. (AREU, Sep 2018). Finland and Refugees. Finland is making adjustments to its asylum policy in regards to Afghanistan. Read “Finland temporarily suspends Afghan asylum decisions”, EuroNews, September 6, 2018. Expanding Health Care in the Remote Areas. Ted Chaiban, the Director of the Programme Division of UNICEF, writes about the investment needed to start and sustain local community health programs in Afghanistan. “Saving Lives in the Mountains of Northern Afghanistan”, ReliefWeb, September 7, 2018. Quiet Progress. A young Afghan (age 24) who works for the Afghanistan Central Asian Association has some good news. Things are not all bad in Afghanistan and its young people will save the nation. Read “Afghanistan’s Silent Signs of Progress“, Tolo News, August 1, 2018. Helping Interpreters. 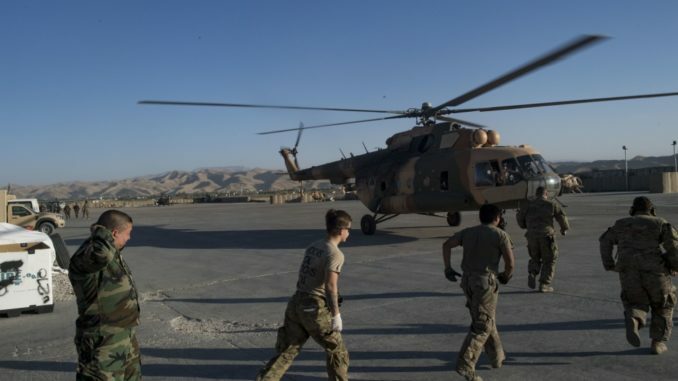 The U.S., UK, and other countries have a mixed record of assisting the Afghan interpreters who accompanied combat units on patrols in Afghanistan. Read how two men and a WhatsApp group has helped Afghan interpreters in the UK. (The Guardian, Sep 7, 2018). CANSOF Investigation. There is an investigation about Canadian special forces personnel not reporting violations on the use of force in Afghanistan. (National Post, Sep 6, 2018). Khalilzad – Back in the Saddle. The appointment of former U.S. Ambassador Khalilzad as a special advisor on Afghanistan reflects a renewed focus on energizing the Afghan peace process. He has vast experience with Afghanistan – he is from Afghanistan’s ethnic Pashtun majority (and, apparently, a big fan of past President Hamid Karzai). Read “U.S. Appoints Veteran Diplomat Khalilzad As Special Advisor on Afghanistan”, Gandhara Blog, September 5, 2018. Journey with the Marines, CIA, Afghanistan, and Arlington. George Whitney led an exciting but brief life. His family received a waiver to bury him at Arlington National Cemetery. Read “‘I begged him not to’: He loved the CIA. And that’s what led to his death”, Stars and Stripes, September 3, 2018. Statistics, Messaging, and Misleading the Public. The United States military is sometimes less than candid on how well things are going or how badly things are going in Afghanistan. For instance, the way it classifies ‘district control’ is . . . well, misleading. If government security forces occupy a district center (a compound with a handful of one-story buildings and high walls) then supposedly the Taliban do not control a district. Even though the insurgents control all the roads and countryside outside of the district compound walls. Read more in “How the U.S. Government Misleads the Public on Afghanistan”, by Rod Nordland, Ash Ngu, and Fahim Abed, The New York Times, September 8, 2018. It Takes a Village . . . . Daniel Green provides his thoughts on the reconsideration of the SOF-inspired Village Stability Operations (VSO) program in Afghanistan. He believes the bottom-up approach is the answer to Afghanistan’s security problems at the local level. Read (in this dated article) “It Takes a Village to Raze an Insurgency”, Defense One, August 31, 2017. Optimistic Generals. 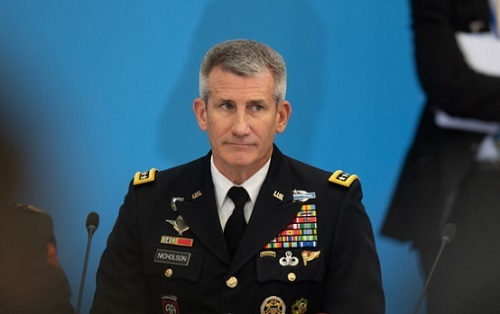 Recently General Nicholson, the Resolute Support Mission commander, set off a media buzz with his final press conference where he was accused of being to optimistic. But one Army officer thinks it is a good thing our generals brighten up the conversation with words of hope. Read ML Cavanaugh’s opinion piece entitled Why America Needs Optimistic Generals, posted on Modern War Institute at West Point, September 6, 2018. ‘We Are Losing’. John Haltiwanger, a politics reporter at Business Insider, says that President Trump and his top advisors aren’t publicly admitting how bad things are in Afghanistan. (Business Insider, Sep 7, 2018). Time to End the War. “Achieving total victory in Afghanistan would take hundreds of thousands of troops, several years, incalculable expense, and would result in far too many deaths.” So says Akhilesh Pillalamarri – an international relations analyst and fellow at Defense Priorities. Read his article “Will We Ever Leave Afghanistan?”, The National Interest, September 6, 2018. “Turn Out the Lights”. With the change of command at Resolute Support and a renewed interest in reconciliation many observers are saying its time to close out the Afghan conflict. Markos Kounalakis – a visiting fellow at the Hoover Institution – says “Our troops are dying for a lost cause. We’ve got to get out of Afghanistan”, Miami Herald, September 6, 2018. War News – Fact or Fiction? According to Rod Nordland, bureau chief in Kabul for The New York Times, there are two wars in Afghanistan. One is the actual fight between the ANDSF and the insurgents. The second is the narrative war of words – the participants include the Afghan government media affairs people, the Taliban, the local (Afghan) media, the international media, and . . . , for course, the public affairs folks at Resolute Support. Read “Who Is Winning the War in Afghanistan? Depends on Which One”, NYT, August 18, 2018. Zimmerman on Security in Afghanistan. A defense policy researcher for RAND Corporation – Rebecca Zimmerman – provides her perspective on the security situation in Afghanistan in this 33-minute long video aired by C-Span on August 26, 2018. SFAB Intel Analyst Profile. Watch a quick one-minute video of an Intelligence Analyst (35F) serving with the 1st Security Force Assistance Brigade in Afghanistan talk about his job advising and assisting the Afghan security forces. (U.S. Army Forces Command DVIDS, July 24, 2018). Force Protection = Mission Success. Watch a short 2-min long video in which a Danish and U.S. soldier explain their mission of providing force protection to NATO advisors as they work with their Afghan counterparts. (Resolute Support, Sep 6, 2018). 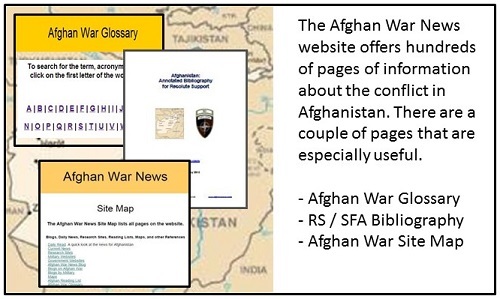 The Afghan War News site has a number of useful web pages about the Afghan conflict. Could be useful to researchers or those getting ready to deploy or work in Afghanistan. Top: Medical team members rush to an Afghan Mi-17 helicopter with wounded soldiers. The ANA 209th Corps abandoned Camp Gormach, Faryab province. Photo by SrA Nicholas Dutton, USAF, RS HQs. Gen Nicholson: Nicholson attending a gathering of NATO at Brussells Summit on July 12, 2018. Photo by Tech. Sgt. Cody H. Ramirez, USAF.